Cecilia was the sixth of seven children born to Ralph and Alice (Nieschwitz) Nudo. When she was just three years old, her father, an electrician for the Ohio Power Company, met with a tragic accident and died. Her mother was suddenly left alone to care for seven children. Cecilia saw how her mother courageously faced each day with faith and love—virtues that were taught and nourished in the family circle. This lived example of deep faith and trust in God influenced the children throughout their lives. Cecilia met the Sisters of Notre Dame as an elementary student at St. Peter School in Canton, Ohio. 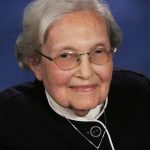 She began her sophomore year in high school as an aspirant at Notre Dame Academy in Cleveland and continued to follow in the footsteps of her three older sisters who had become Sisters of Notre Dame (later, two of her sisters withdrew from the Congregation). 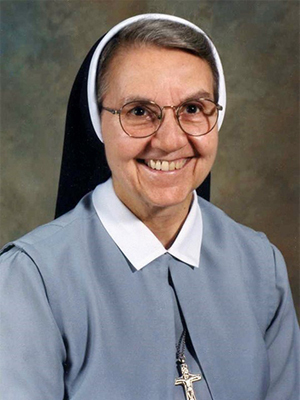 Cecilia entered the novitiate on February 2, 1949, and at investment received the name Sister Mary Louismarie. Sister received a bachelor’s degree in education from St. John College in Cleveland, Ohio, and a master’s degree in special education from Cardinal Stritch College in Milwaukee, Wisconsin. 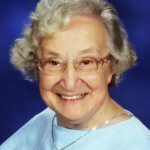 Her ministry in the primary grades spanned more than forty-five years—years in which she taught lessons not only in math, phonics and handwriting, but about life and love for God. Sister Mary Louismarie’s greatest joy was preparing children for the reception of their First Holy Communion. 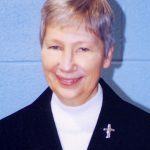 She was a woman of conviction and a gifted teacher who had a passion for Catholic education. In her ministry with the children, she was kind and generous, yet exacting, helping to provide them with a foundation for life. Although small in stature, there was nothing small about the way Sister Mary Louismarie lived her religious life. With child-like simplicity, her greatest desire was to seek God alone. Since 2000, Sister lived courageously with the progressive effects of Alzheimer’s disease. This initiated a new chapter in her life’s journey. She was no longer able to relate in conversation, but when offered a one-on-one stimulus, Sister’s face would glow with appreciation. She responded with a smile of acceptance and gratitude for the loving care she received and was an inspiration to those who visited during her long illness. 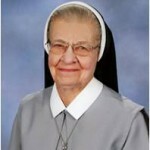 May Sister Mary Louismarie now be embraced by the limitless love of our good and gracious God.